High-quality products are the basis of company work. In comparison to the cost of 1 print with original cartridges, users of our products receive 20-30 multiple times economy, or 1000-1500 % economy at constant high quality. However the main question for the choice between original and compatible consumables is a parity "price/quality". Our main goal - is to provide the same printing result, as that of original cartridges. - All kinds of goods: CISS, ink, photo paper are made so that as much as possible to correspond to characteristics of original products and to provide a stable qualitative printing result. 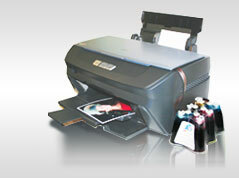 - INKSYSTEM products do not concede, but even exceede the quality of printer manufacturers. For example, when it comes to whiteness of photo paper sheets, INKSYSTEM Premium Glossy quality exceeds similar production of ТМ «Epson». - A special department of the company develops personal color rendition (ICC-profiles) which allow to reach 99,99 % of qualitative color rendition which in some cases is better, than using original consumables as the manufacturer of printers develops an average profile for all printers, but you have a possibility to create a personal IIC profile, for your printer with the specific serial number. Examples of ICC profiles you can download or order individual ICC profile here.